New Delhi: Shruti Debi hasn’t plowed through as many autobiographies and biographies as she has in the last 10 months since becoming a literary agent. Suddenly, India’s English-language writing universe is awash with life stories of all kinds. Public figures are queuing up to get their personal narratives “recorded and preserved", says Debi, director and senior agent, Aitken Alexander Associates India Pvt. Ltd. That’s being fuelled on the other side by a growing curiosity on the part of readers about public figures and celebrities, a hunger that publishers are happy to satisfy. Almost all major publishers—Penguin Books India Ltd, HarperCollins Publishers India Pvt. Ltd, Picador India (an imprint of Macmillan Publishers Ltd) and Tranquebar (an imprint of Indian publishing house Westland Ltd)—are releasing an increasing number of titles in the genre over the next three-four months. Those about whom the reading public can soon know more include politicians, sports persons, business heads and even media personalities. From not having a single title in the genre till last year, HarperCollins will release at least six biographies and autobiographies in the next four months. These include books by and on shooter Abhinav Bindra, DLF Ltd chairman K.P. Singh, former tennis player Vijay Amritraj and West Bengal chief minister Mamata Banerjee. The publisher released Shoaib Akhtar’s controversial autobiography Controversially Yours two weeks ago. “Call it voyeurism if you must, but people want to read everything about personalities, their achievements, their failures, their secrets," says Shantanu Ray Chaudhuri, chief copy editor at HarperCollins. The initial print run of 10,000 copies for Controversially Yours has been sold out and the company is printing another 5,000, he claimed. Renuka Chatterjee, chief editor, Westland, says: “What’s gradually changing is the willingness of public figures to be candid while getting published." Indian publishing is changing dramatically with 60% of books being sold in the non-fiction category, says Daniel Watts, regional director for India and Asia at Macmillan Publishers (China) Ltd. What’s more, instead of international authors dominating the shelves, 70% of the books sold in the country are written by Indian authors. “We’ve recognized the interest (in the genre), now we’ll look at identifying interesting local identities and expand," Watts said. Picador India will also aggressively tap the genre over the next year. 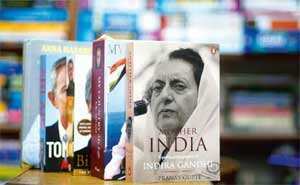 Picador’s biographies in the next few months include one on Congress president Sonia Gandhi and another on Ajit Balakrishnan, founder, chairman and managing director of Nasdaq-listed Rediff.com. There is a conscious effort on the part of publishers to commission and publish more biographies and memoirs, and a willingness on the part of their subjects to be forthcoming about themselves, says Udayan Mitra, publisher, Allen Lane and Portfolio, Penguin Books India. In the next two-three months, Penguin will publish Lucknow Boy, the memoirs of Vinod Mehta, veteran journalist and Outlook Publishing (India) Pvt. Ltd editor-in-chief. Other books in the genre from Penguin will feature former Bangladesh prime minister Sheikh Mujibur Rahman, Oscar-winning sound designer Resul Pookutty. The company has increased its list in the genre by roughly 30% compared with the previous year, when it published around 15 such titles. “The range of subjects, which include politicians, statesmen, reformers, mediapersons, thought leaders…is wider than before," said Mitra. Several of the books will feature politicians, who generally take their secrets to the grave. Both Penguin and Tranquebar are planning biographies of Rahul Gandhi. Penguin is also publishing a biography of Nitish Kumar, the chief minister of Bihar. The genre is not without risk as was evident from the experience of Siddhartha Deb’s The Beautiful and the Damned: Life in the New India, a narrative non-fiction account of contemporary India. It had to be released in India without its first chapter, which featured Arindam Chaudhuri, who runs the Indian Institute of Planning and Management, a chain of business education schools. Chaudhuri obtained a court injunction over what he regarded as an unflattering description. The fear is that such threats could force authors to play safe and write boring books, especially as India bans biographies and autobiographies with alarming alacrity. “Let everyone write responsibly, but not conservatively," says Debi of Aitken Alexander, an international literary agency that opened its India office earlier this year. Debi was previously editor at Picador. Meanwhile, the genre also supports ghost writers who do the heavy lifting on celebrity autobiographies. According to a publisher, who didn’t want to be identified citing company policy, ghost writers get Rs4-6 lakh for a project. “It’s a win-win situationbecause celebs often buy back a lot of books. My only concern: the publishers should maintain writing quality, especially in this genre," the person said.